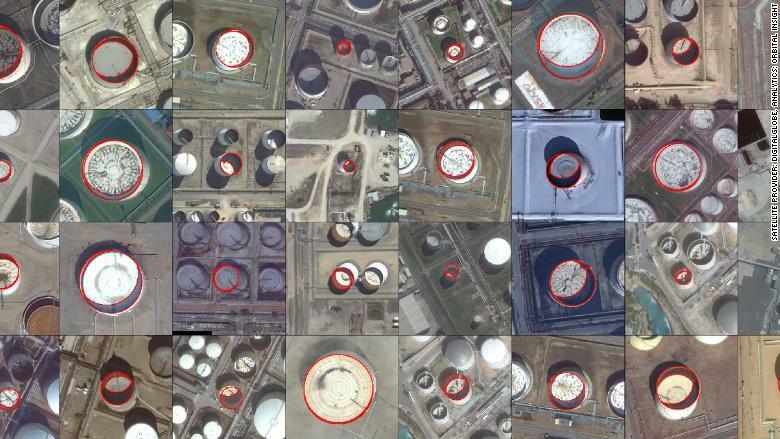 Orbital Insight used AI to analyze satellite images and calculate how full these rooftop oil tanks are. Innovation, massive investment and lower costs are fueling a new commercial space race. Companies working on the technology have attracted big money. Orbital Insight raised $50 million in funding last year, while Descartes Labs attracted $30 million and SpaceKnow raised $4 million. One of the industry's pioneers is James Crawford, who worked for NASA and Google before founding Orbital Insight in 2013. "We were seeing an explosion in commercial satellites," said Crawford. "And I thought, 'Once all that data comes back to earth, we have to do something with it.' "
Orbital Insight can provide data on how much oil is being held in large land storage containers, or how many cars are in a Walmart parking lot, Crawford explained. This data has real economic value. "Supermarket car counts, for example, are a predictor of sales," Crawford said. "We're sifting images of the whole world every day, and artificial intelligence allows us to process that. We're in the middle of two major revolutions: AI and commercial space," he added. Orbital Insight measured car parking around the 2016 Superbowl. Descartes Labs got started in 2014, with its sights set on using AI to process vast amounts of satellite data. The first application of its technology was building a model for US corn production. "Cornfields are great for satellites in terms of image resolution. Cornfields are big, corn grows slowly and it doesn't wander," said Mark Johnson, co-founder and chief executive of Descartes Labs. Satellite imagery was used to locate fields, figure out what crops were growing in them, assess how healthy the crops were and then calculate likely production levels. "Satellites are taking pictures of the whole world. That's a global dataset," he said. "We are applying modern machine-learning techniques to that data, and using it to better understand our planet," he said. 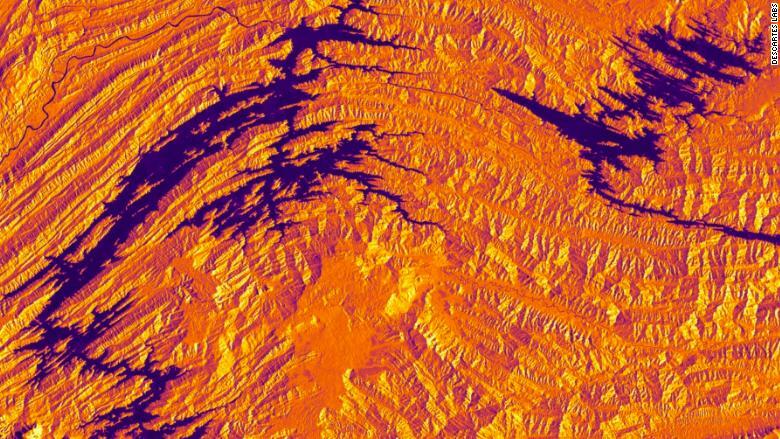 Descartes Labs analyzed satellite images to show reservoirs in Borneo. 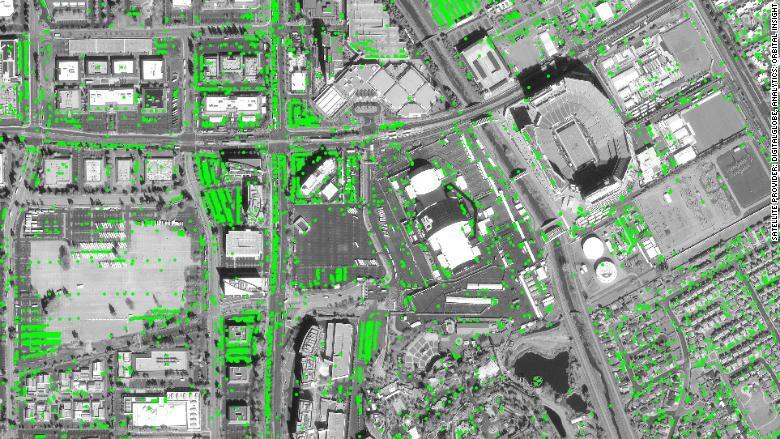 SpaceKnow builds economic indexes using earth observation imagery blended with other data. For example, it tracks 6,000 industrial facilities across China to generate an index of manufacturing activity. Hugh Norton-Smith, vice president at SpaceKnow, said the company aims to take the "messy, unstructured physical world and index it on a digital platform in near real-time". SpaceKnow's clients include defense agencies, commodity traders, hedge funds and other investors. Crawford, from Orbital Insight, believes the resolution of satellite imagery will improve and become cheaper, meaning quicker, more accurate insights. "We'll be able to tell, mid-way through Black Friday, how sales are going by counting cars in mall carparks. We're three to five years away from intraday data insights from satellite data. It will grow from there in terms of its ability to help us really understand what's going on in our economy." Given the relative newness of the commercial satellite industry, Mark Johnson believes we are "only starting to scratch the surface" of the power of geospatial analytics. And the technology's applications extend beyond business. "There are implications in terms of tracking deforestation, climate change, food security," Crawford said. "Data on building height and city density can facilitate poverty mapping." Johnson said that insights from satellite data can be used to help real people. For example, he said researchers at the Los Alamos National Laboratory used the Descartes Labs database to find pools of stagnant water in a given region, enabling them to map mosquito risk and put in place disease prevention measures. "Forecasting, and the ability to do that more accurately, is obviously interesting from a financial perspective," Johnson said. "But there are a lot of reasons why everyday people should care about this technology too."